This event has reached full capacity. Thank you for your interest in this event. Please visit the Events Calendar for other opportunities. Hidden from the public’s view off the trail around Beaver Lake lies the Stanley Park bog. This rare habitat is home to sphagnum moss, bog laurel, Labrador tea and the carnivorous round-leaved sundew plant. Alterations to the hydrology in the Beaver Lake watershed over the past 90 years have reduced this threatened habitat to only a fragment of its former size and nearly resulted in the loss of several rare local species. 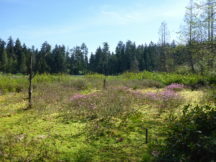 This month, as part of two EcoStewards restoration events, we will continue to ensure the ecological integrity of the restored bog by removing invasive non-bog species. Volunteers must enjoy working outdoors and be prepared to perform physical work in all weather conditions. Due to limited space at the bog, registration is limited to 6 volunteers per event. A reminder email with detailed information about the day’s activity will be sent to registered volunteers a few days before the event. Volunteers should arrive dressed for the weather with rain boots or sturdy shoes to walk in mud, and be prepared to work on uneven terrain. The registration is closed for that event.